It used to be that if you wanted to record music you needed thousands of dollars' worth of equipment. Even if you needed accompaniment to help you practice, it was either costly or you had to enlist others. Now, all you need is a computer and an internet connection. And often, you don't need an instrument or any type of training either. There are numerous free online music tools available for burgeoning musicians and those who just like to tinker. Below are 50 of the best free online music tools that we've curated for you, making this list an excellent resource for musicians. How did the following online music tools make our list? Obviously, they are free and online. We had a preference for sites that are easy to use and intuitive. The deciding factor, however, is they encourage, inspire, and support creativity. That's why these 50 online music tools are excellent for amateurs, students, and professional musicians alike. 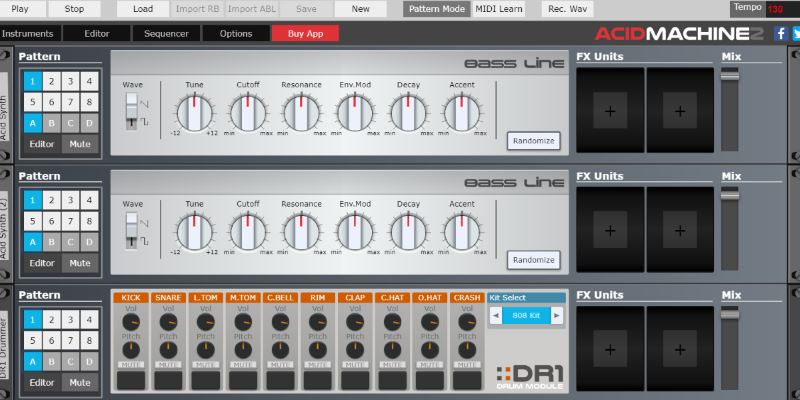 Acid Machine – This terrific site offers a pair of Roland TB-303s and basic drum machine sounds. Use the randomize button if you need some inspiration. This is a seriously cool-looking tool too. Ambient-mixer – Visit this online tool to add complex ambient sounds to your music. You can mix their soundscapes too. Our favorite is "On a Ship at Sea." This site also allows you to listen to "relaxing music, ambient atmospheres and astonishing sound effects"as well. Autochords – Check this out when you need a chord progression to unblock your creativity. Audacity – Audacity is an audio editor and recorder. It's a celebrated program for musicians and producers. Audacity is so good, and has so many options, it's hard to believe you don't have to pay for it. Audio Tests – A marvelous online tool for testing your audio equipment. You can test everything from subwoofers to headphones as well as the phase of your speakers and your studio's acoustics. 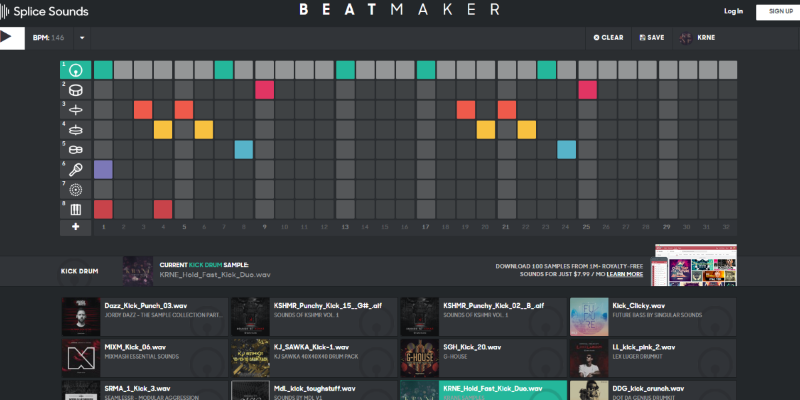 Beatmaker – With Beatmaker, you'll be dropping beats in no time. It's uncomplicated and a blast to play with. BlankSheetMusic – This online tool enables you to print blank sheet music. You can't add notes, but you can add stuff like treble clefs, bass clefs, and guitar tabs. Chrome Music Lab – Sure, this laboratory of tools are more about having fun during your lunch break then putting together hot tracks, but an imaginative musician will utilize CML to their advantage. Clyp – Clyp allows music makers to record and upload audio files. It then turns your file into a shareable short link that you can share or embed. Dolmetsch Online – If you need help with music theory visit this site. Want some free sheet music? They have that too. Easy ABC – This is a quality sheet music creation program that works with ABC Files. Frequency Chart – This fabulous looking chart is a great resource when you want to know the frequency range of instruments and the human voice. What sounds "tinny?" This chart will tell you. 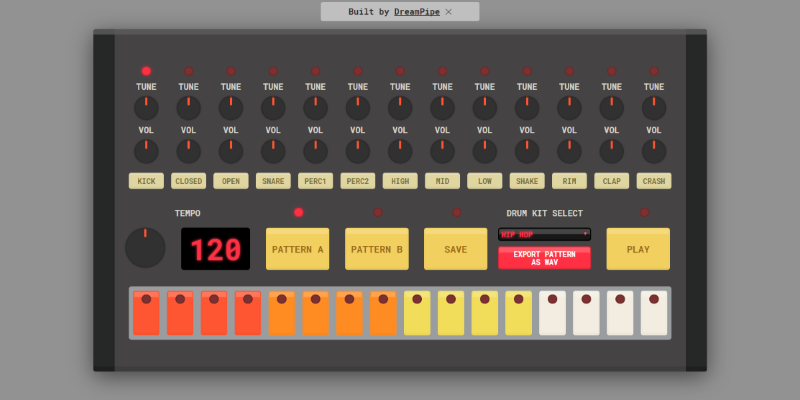 HTML5 Drum Machine – A fabulous little drum machine for those tracks that call for a retro beat. How To Practice – Whether you're in a rock band or a symphony, you need to practice. HTP has a plethora of resources and articles to improve your practicing habits. Learning Music – If you're just starting your musical journey, or need a refresher course in making music, peruse this page from Ableton. LilyPond – Part of the GNU Project, LilyPond bills itself as a "music engraving program." Basically, this online tool can help you make beautiful-looking sheet music. Metronome Online – A simple metronome that tells you the technical term for whatever beats-per-minute you select. The Modal-matic – This site helps musicians find chords and progressions within a given mode like Ionian, Dorian, and Lydian. Musescore – This free download allows users to create and print sheet music. You can compose sheet music for choir, guitar, orchestra, and piano. 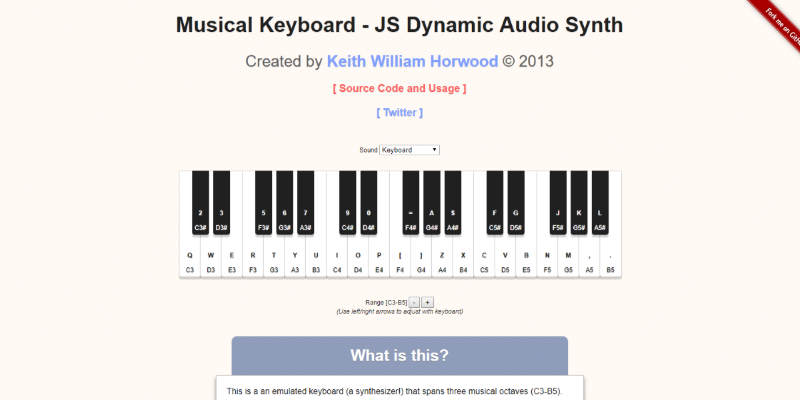 Musical Keyboard – Keith William Horwood created this charming online synth. It has four presets and you can play it with your mouse or QWERTY keyboard. Musink – Musink is a music-composition software package. Create music in variety of formats including MIDI files. You can also export your sheet music. 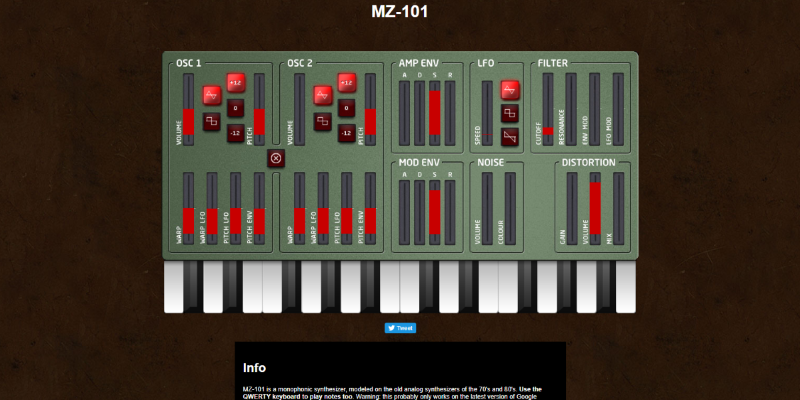 MZ-101 – MZ-101 is monophonic synthesizer inspired by the monophonic analog synthesizers of the 1970s—you can save and load presets. Noteflight – The free version of this site allows maestros to compose ten scores. When you're done, you can print or share your tunes. Novation Launchpad Intro – Novation Launchpad Intro lets you remix preselected loops. This is a great introduction to the Novation's popular MIDI controller. Online Guitar Tuner – This tool boasts a basic guitar tuner with ten alternative tunings. Online Sequencer – This online sequencer allows you to input notes with your mouse. Available instruments include electric piano, violin, and guitar. Online Tone Generator – Lots of helpful tools available here. We're spotlighting their pitch shifter. Change the pitch of an audio file without changing the tempo. Patatap – When you first arrive at this site you'll probably think something is wrong. Don't worry. Everything is fine. Just type on your QWERTY keyboard to create music. When you do, images will flash on your screen. We recommend starting with the "O" key. 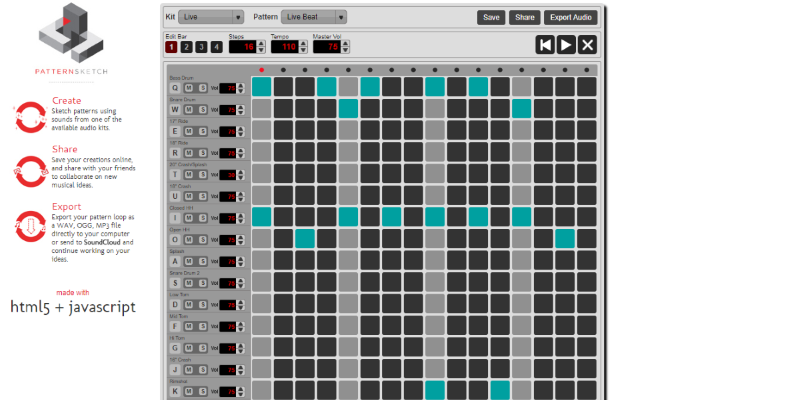 PatternSketch – This audio sequencer and drum machine lets you create, save, and export loops. Pixelsynth – As the name suggests, Pixelsynth turns images into sounds. Don't expect to create anything melodic, but if you want to make far out soundscapes, this tool is for you. Sampulator – Each button on your keyboard corresponds to a different sound. Pressing the "shift" key starts the recorder. Don't forget to save your loops. Songsmith – It might not produce a track you'll use in a recording, but it can help spark some creativity. Here's how it works: sing your song, or musical idea, into your computer's microphone and Songsmith will produce backing music. Sonicbids – Inventor of the Electronic Press Kit, Sonicbids can help your band find gigs. SoundGym – Makers of this site operate on the theory that successful musicians and producers are better listeners. That's why they offer a wide range of ear training resources. Soundtrap – Soundtrap is a slick online studio that makes creating music a breeze. You'll need to create an account or sign-in via Facebook, Google, or Office365. 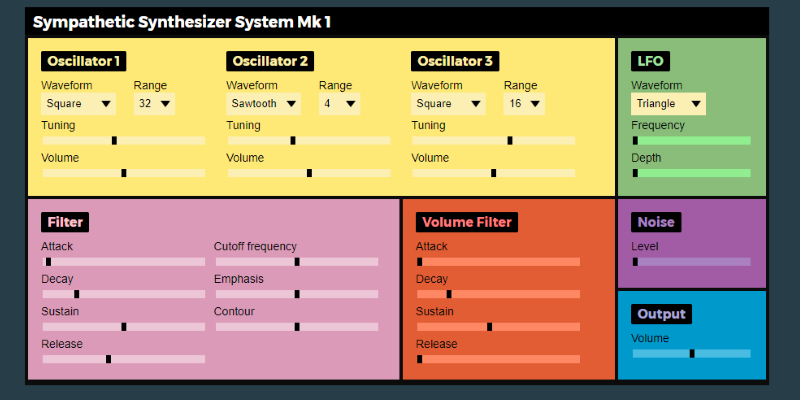 Sympathetic Synthesizer System Mk 1 – This online synth is ideal for musicians looking to create, or recreate, retro video game soundtracks. SynthShare – This service allows you to receive constructive criticism and useful advice about your music. Tabletop Audio – Tabletop Audio serves up a plethora of "original ambient soundscapes." While you'll there, make sure you create a custom soundpad. Teoria – Take a break from creating music to train your ears. TrueGrid – TrueGrid is perfect for the experimental musician. Manipulate a modular synth by moving images of nobs and patches with your mouse. You can also play your modular synth with your MIDI keyboard. Typatone – Play music via your keyboard. Record your keystrokes and play them back via a loop. 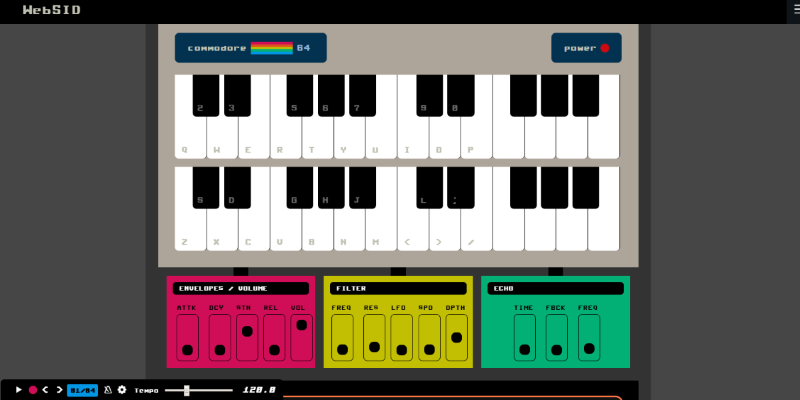 Typed Drummer – Channel your inner John Bonham or Keith Moon with nothing more than your keyboard. Simply type in the box and you've got a beat. In fact, we recommend typing the word "beat." 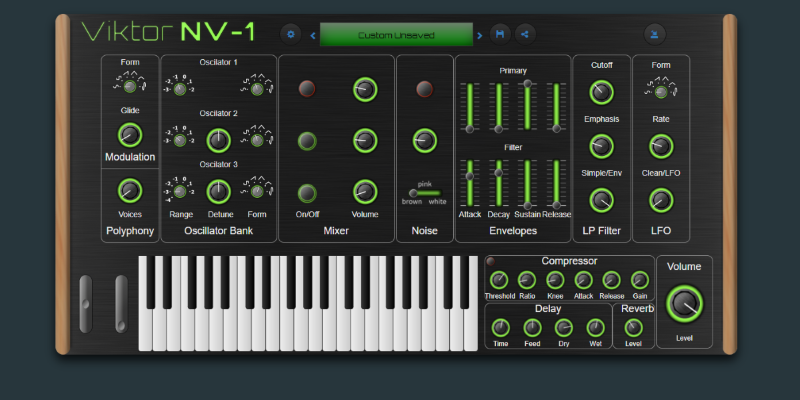 Viktor NV-1 – A very cool synth that you can play on your QWERTY or MIDI keyboards. It comes with 30 presets. Virtual Drumming – Rudimentary virtual drum kit that's lots of fun. You play by clicking the heads and cymbals of an image of a drum set. vozMe – Chose a male or female voice then type your text. This tool immediately turns your words into a mp3 voice recording. 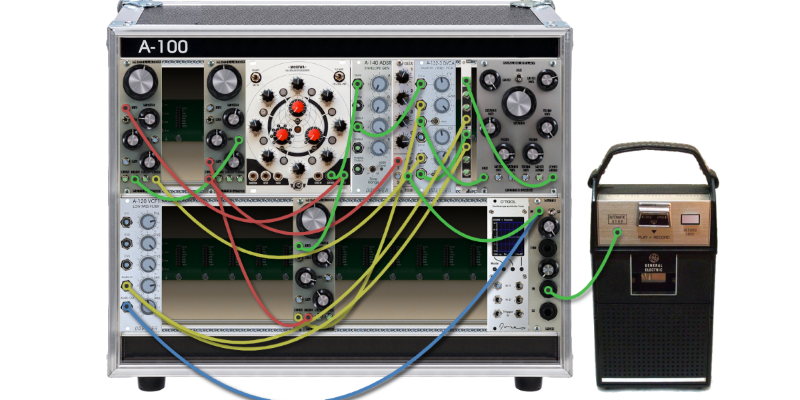 WebModular – A modular synth inspired by the ARP 2600. WebModular has an on-screen keyboard and supports MML. WebSID – This is a recreation of the SID sound chip found in the old Commodore 64. WebSID is retro and undemanding to play. WebSynths – WebSynths is a 3-oscillator synth that comes with 136 presets, tons of post-processing effects, and envelope shaping. WebXoX – This online tool has just four drum sounds but you can control those sounds in a bunch of different ways. 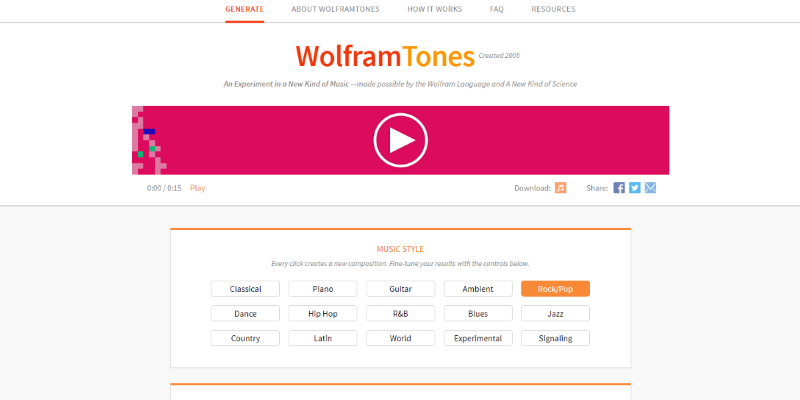 Wolfram Tones – This amazing tool allows users to pick samples from more than a dozen genres of music. After setting up your loop, you can alter rhythm, pitch, and instrumentation.